March has come in like a lion with a huge snowstorm bringing more than a foot of snow, and now the spring thaw has begun 10 days into the month. Rain has been pouring down all day, the yard is flooded as the earth cannot swallow up the water fast enough. We put a new bird feeder up on the outside of our living room window, during the snow storm. It has been such a treat to watch woodpeckers, cardinals, blue jays and all the pretty birds that cohabitate in our yard, but a little more up close and personal. We have always been avid bird watchers, journaling about what we see, blogging about what we observe and pondering over their cycle with the seasons. Little Eagle has a big birthday coming up. He is hitting the double digits. 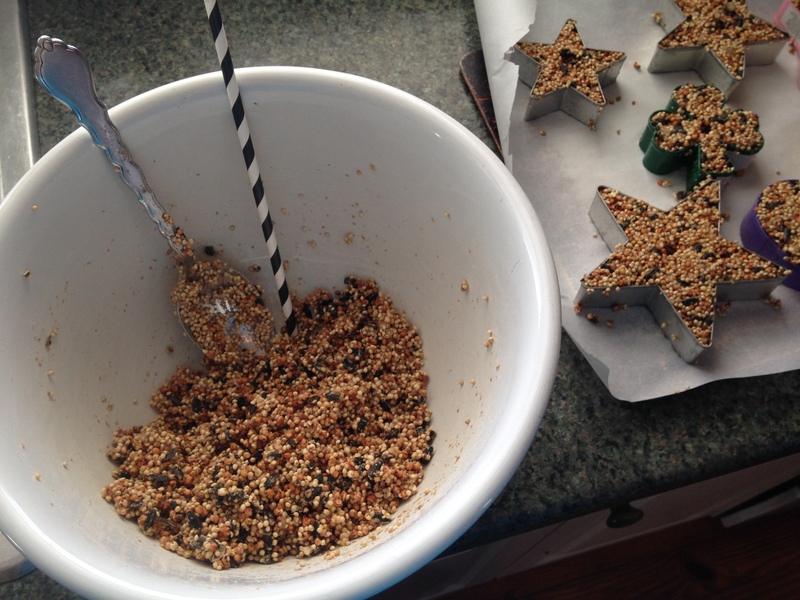 We were so inspired by our bird friends that we decided to make bird seed ornaments as birthday favors. Little Eagle will give them out to friends at church, and cousins. We are not having a formal birthday party with his friends this year, because he had a big one last year. We decided as a family that each child gets to rotate having a big party. Each child gets a big party once every two years, until Cedar is older, then it will be every three years to include him. The amount of money, planning and time is taken into account, otherwise we gather as a family. 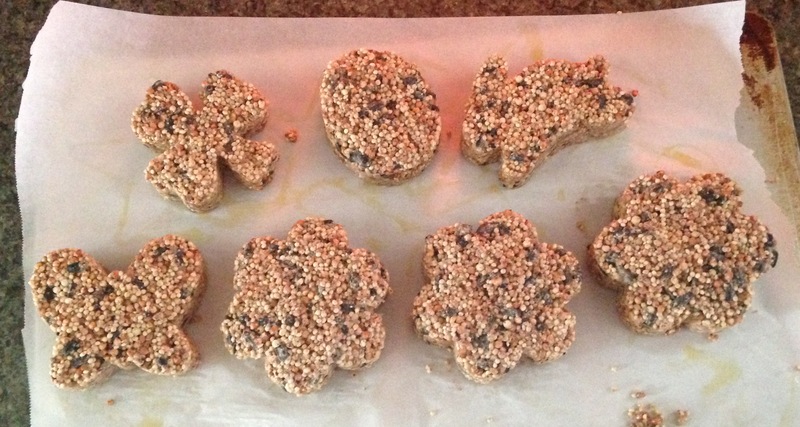 I got a recipe for bird seed ornaments off of Pinterest. There are many more recipes to choose from, if this one doesn’t suit you. Make sure you spray the cookie cutters with cooking spray. This is imperative. I did a test batch and basically ruined the shapes, because they did not pop out of the cutter easily. Then I laid them out on wax paper on a cookie sheet. The recipe makes about 8 ornaments. So far I have made 17 successful ornaments. The rest I will use here at the house. When it was all mixed together I packed a handfull into the cutter and pressed from both sides filling it all in. Then I placed it on the wax paper and pressed the top down. With the test batch I used a straw to make holes in the ornaments for string, but decided not to do that with the other batches. I will take embroider floss or hemp and just wrap them to hang. Here is a picture of the ornaments curing. The shamrock is delicate and won’t make it, so I added it to our home stash. The Easter egg, bunny, butterfly, flower and star works out. If you are in a pinch use ball jar lids! To make tags I used a unique paint brush and made a pretty design on watercolor paper, both sides. Next I cut out shapes, punched holes and wrote “Little Eagle turns 10!” This will slide right on the string to hang them. 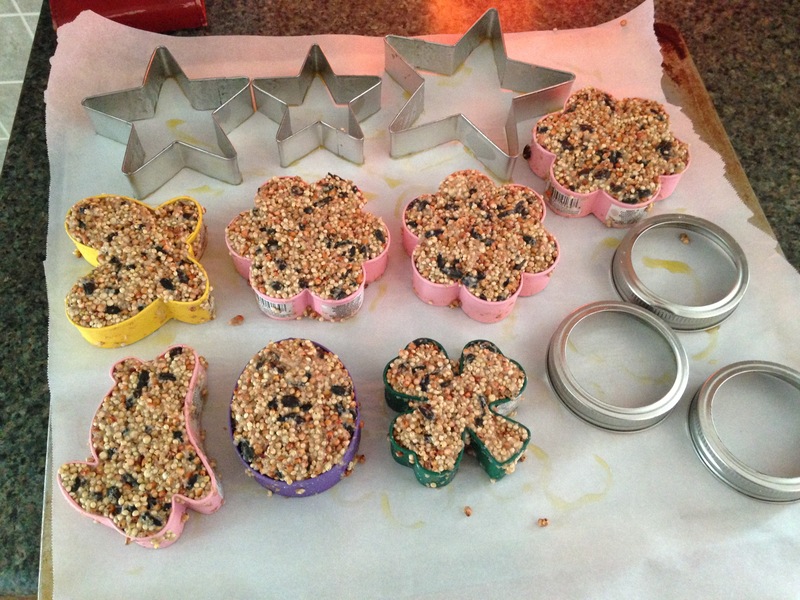 This craft takes a little planning and doing, very little money and it is a great sensory experience packing the cookie cutters with bird seed. You get to take a sneek peak early, because this mama has to plan with all the busyness of spring. Enjoy.